In 1859 the area that is known as North Melbourne was named the Hotham borough, after the governor of Victoria Charles Hotham. Hotham's first Post Office opened on 20 March 1860 and by 1861, Hotham had a population of over 7,000. 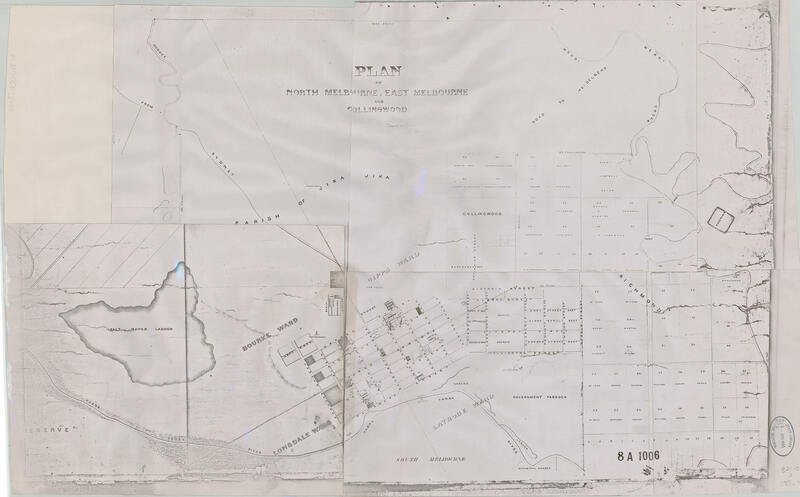 On 26 August 1887 the Hotham Borough was renamed North Melbourne Town, after the completion of the North Melbourne Town Hall and the Metropolitan Meat Market. The beginnings of Melbourne can be traced to the establishment of markets in Melbourne. Previously in 1839 the New South Wales government passed An Act to authorise the establishment of Markets in certain Towns in the colony of New South Wales and for the appointment of commissioners to manage the same. The Governor, on the advice of the Executive Council, could fix the number of Market Commissioners in proportion to the town population. If the town had a population of more than four thousand then the Governor could divide the town into wards (not to be less than three) and have at least two commissioners for each ward. The Market Commissioners were to be elected from proprietors of land and householders within the town limits. The voters were householders or occupiers of dwellings valued at more than 20 pounds and proprietors of land or buildings to the value of 200 pounds. Market Commissioners were to hold office for three years. In Melbourne markets were not established until 22 October 1841, at which time Melbourne was divided into four wards for the purpose of electing Market Commissioners. The commissioners held their first meeting on the 8 November 1841. Melbourne was created a town by the Melbourne Incorporation Act 1842. Powers of the Market Commissioners were transferred to the newly created Council. The four wards originally set up as the wards for the election of the commissioners became the four wards of the new Council. These wards were Bourke Ward, Gipps Ward, LaTrobe Ward, and Lonsdale Ward. As set out in the legislation the Mayor and Town Clerks main duties were to perambulate the metes and bounds, a task that was to be undertaken every three years. The first perambulation took place on the 4 February 1846. On the 25 June 1847 Melbourne was created a Cathedral City by letters patent signed by Queen Victoria. The Council began referring to itself as the City of Melbourne around this time, although the New South Wales Act conferring Melbourne with the title of City was not passed until 1849. Between 1850 and 1860 several new wards were created and new municipalities were severed from the City. Collingwood and Fitzroy Wards were created in 1850. Collingwood became a municipality in 1855. Fitzroy became a municipality in 1858. In 1856 Smith Ward and MacArthur Ward were created. Smith Ward continued until 1979, but MacArthur Ward was severed in 1860 to become Sandridge (later to be renamed Port Melbourne). Other municipalities were severed from the City of Melbourne during this time: Emerald Hill (South Melbourne), Richmond and St. Kilda in 1855, and Brunswick in 1857. Both Victoria Ward and Albert Ward were added in 1869 bringing the total number of wards at the turn of the century to seven. In 1902 a warrant conferring the Mayor of Melbourne with the title of Lord Mayor was signed by King Edward VII. On the 30 October 1905 the City of Melbourne was united with the Borough of Flemington and Kensington and the Town of North Melbourne (formerly known as Hotham). 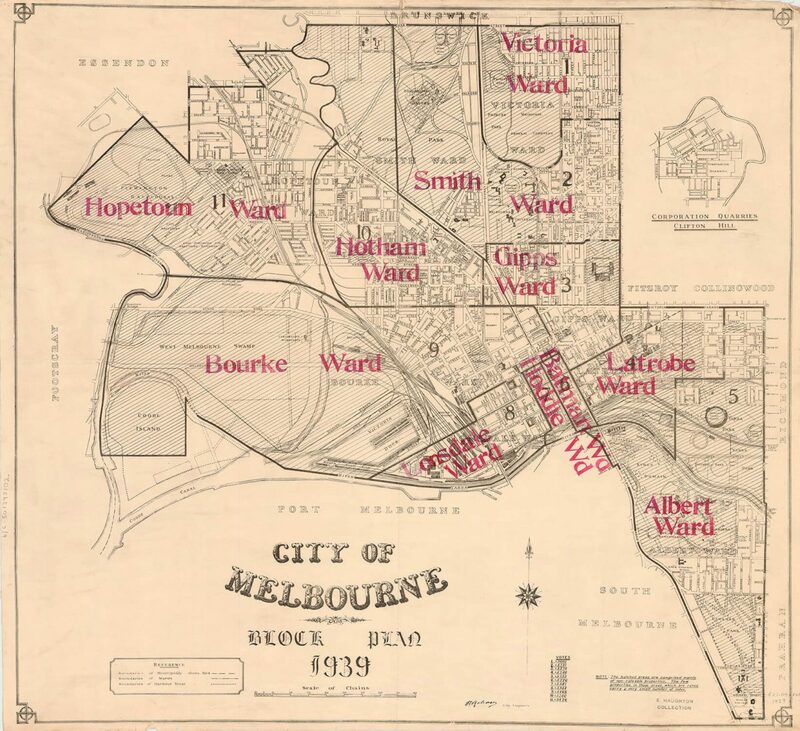 To accommodate the new citizens to the City of Melbourne a new ward was created. This ward was known as Hopetoun Ward. In 1938 the Melbourne and Geelong Corporations Act abolished the office of alderman and required the election of three councillors for each Ward. The Council successfully petitioned for the City to be re-subdivided into eleven wards. Hopetoun Ward became the area once known as the Borough of Flemington and Kensington, Hotham Ward was the North Melbourne part of the former Hopetoun Ward, and Batman and Hoddle Wards were created. In 1979 on the recommendation of the Local Government Advisory Board the City was re-subdivided into eight wards by Order in Council. According to the Order all councillors were to go out of office on the day appointed (19 May) and a general election held. This was later altered by the City of Melbourne (Re-subdivision) Act 1979, which decreed that councillors whose term of office was to end in 1979 would go out of office on that day, councillors whose term of office was to expire in 1980 would go out of office that year, and councillors whose term of office was to expire in 1981 would go out of office in that year. Over a period of two years the number of councillors was reduced from thirty-three in 1979 to twenty four in September 1981. On the 6 May 1980 the Council were dismissed by the Minister for Local Government and replaced by three commissioners. In 1982 the Council was returned following a change of government. The City was re-subdivided into six wards and elections took place on 4 December 1982 under the provisions of the Melbourne Corporation (Election of Council) Act 1982. In 1983 at the election of the Lord Mayor it was decided that the position of Lord Mayor would be elected annually. In 1985, due to the recommendation of a division of the Local Government Commission, the City of Melbourne was again re-subdivided, this time into seven wards.